I had heard a lot of excitement about the re-opening of the National Gallery of Art’s East Building, and it definitely lives up to the hype. The last time I had visited the East Building was when I was looking at colleges in D.C. in 2012- it was amazing that time, but has definitely improved. It appears that there is more artwork and that there may have been some additions to the collection. 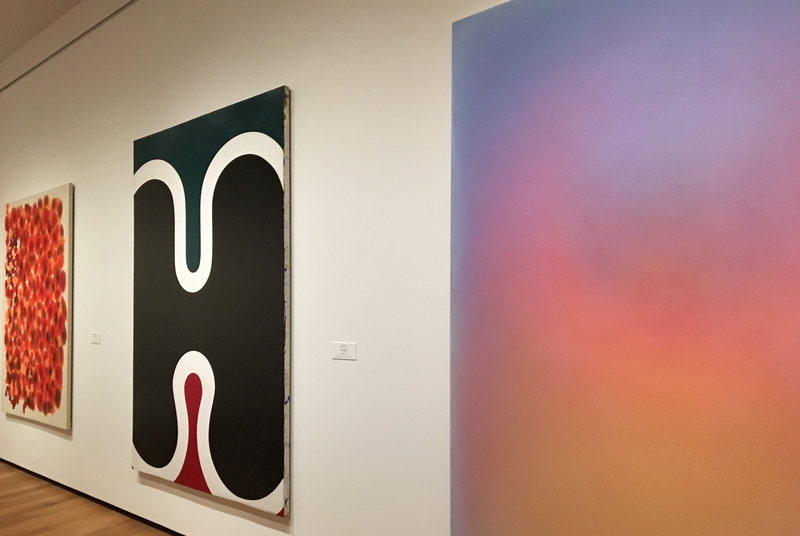 The museum presents a number of pieces from the areas of abstract expressionism, surrealism, pop culture art and the Color School artists (seen above in the painting on the far right). I have always loved modern art as I love the bold colors and, often, the use of geometry and striking patterns. Having taken art history, I also came to understand some of the reasoning behind the use of color, often in what appears to be an oversimplified way, yet actually extremely thought out. The museum covers a wide stretch of modern art, and it was very interesting to see the progression from surrealism and dadaism to abstract expressionism as I walked through the galleries. It almost reminded me of a mini MOMA, but definitely with its own clear identity hear in D.C. To read more about the changes that were made with the renovation, read more here. One of the galleries I was most looking forward to seeing was as I would call it, “the Rothko Room.” Mark Rothko is one of those artists that if you haven’t studied modern art, it might appear that they are very simple paintings. I liked the way the label explained his art to the viewers: “He refused interpretations that focused on formal issues of color, light, and space, insisting that he was ‘expressing basic human emotions-tragedy, ectstasy, doom. '”Although perhaps a bit intense, the museum labels give us an idea of what the artist may have been thinking when creating what might initially appear to be just two green square surrounded by a blue border. Leon Berkowitz was an artist connected with the Washington Color School, which were artists who focused on abstract art that looked at different aspects of color. Painter’s Table provides some other examples of art from the Washington Color School. One part of the museum that is easy to miss, but don’t, is the rooftop terrace. I feel like terraces at museums have become increasingly “trendy” for lack of a better word. Having spent the summer in New York, I think of the rooftop at the Met, which is hard to beat. There is currently a giant blue bird sculpture on the terrace (great Instagram opportunity). Hanna – this was such a great post. I loved how you incorporated all types of media, especially the video. It gave a different insight into how the museum really looks/feels. I also like how you bolded certain sentences to break up the more important parts of your thoughts. It made it super easy to read. My only edit would be to move the Washington Post article to its own line. It looked a bit cluttered next to the paragraph. All in all, awesome post! Hi Jamie- glad you enjoyed the post and thanks for the feedback on the layout! I loved this post! Art does lend itself well to a slideshow format, but it was cool how you made the pictures more interesting (different angles, putting yourself in it, etc) than just straight images of the art on the walls. The video was a nice touch as well. I remember reading one of your earliest posts and, while I enjoyed it, it’s cool to see how much your blog has evolved over the past few weeks. Hi Melissa- thanks for sharing your thoughts and glad you liked the post. Great post! I think the best part of this post is how visually engaging it is – you allow the photos to take center stage, and put sentences and phrases in bold to capture the reader’s eye. The slideshow was definitely a great way to put a bunch of pictures in one area without getting too cluttered around the text. Also love your analysis – I also noticed the terrace trend at museums and agree that the Met has the best, but it does offer great Instagram opportunities, which has been a strategy for a lot of museums around the country.